The Scale option allows combining side-by-side prices in clusters. This is useful for the instruments with a large range of movement relative to the price step (e.g., the futures for the RTS index). 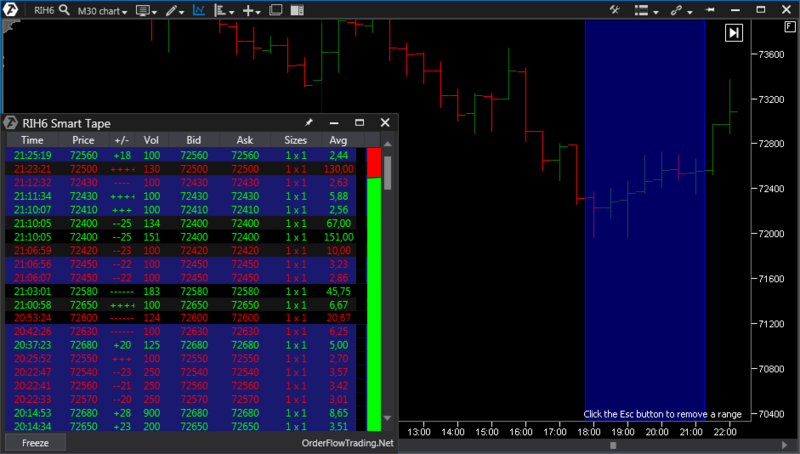 Click on the highlighted icon on the chart menu bar. The Scale parameter sets the number of prices levels to be combined. The Scale by lower level parameter determines the mode of price level combination. This function allows opening linked windows (i.e., windows that are associated with the current instrument), which display both online and historical data. Select the necessary instrument from the list in the pop-up window. After at least one linked window has been created, a new menu item will appear that is responsible for the data display mode in linked windows. Real Time Mode: this mode is used to display in the linked windows data of the same instruments as on the chart instruments in real time. Historical Mode: history viewing mode. In this mode, the user is prompted to select the historical range for which data in linked windows will be displayed. The first click of the mouse on the chart determines the start position; the second click, the end position. To change the range, delete the old range using Esc key and specify the range again. Also, the range can be shifted to the left and to the right using the corresponding keyboard keys (right / left arrow keys). * The tape only displays the data for the selected period in the chart. Displaying the Chart on Top of Other Windows. 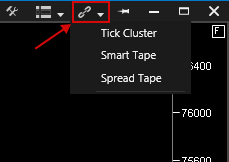 To display a chart on top of other windows, use the“pin” icon on the chart menu panel.